What Else Can I Expect From an Online Master's in Information Technology and Systems Program? Information systems are a cornerstone of 21st century management and administration. An information system is designed as any set of tools used to collect, interpret, record and organize any type of data. Most of today's information systems are computer-based models with hardware, software and network components. Information systems and technology is an academic field that explores the relationship between the methods and algorithms used in information management and the technology platforms that drive these systems. Online information systems and technology master's programs offer a flexible, easily accessible alternative to traditional college education. Students seeking a master's in information systems and technology will gain a broad understanding of this field. The curriculum incorporates key subjects like data analysis, network administration, information security and data management, as well as software development, computer science and other STEM areas. These master's programs often culminate in a capstone course, allowing students to demonstrate the skills and knowledge they have gained with a comprehensive research project. Many of today's students are choosing to earn their online master's in information systems and technology online. Web-based students follow the same rigorous curriculum as their brick-and-mortar counterparts, leading to the same number of job opportunities for successful graduates. The asynchronous (or self-paced) schedule and study-from-home format are also ideal for students with part-time jobs, childcare duties and other commitments that may interfere with campus-based learning. The Bureau of Labor statistics projects this field to grow between 2014 and 2024. The unemployment rate for many information systems and technology jobs is low. So graduates will be entering a strong job market. Read more here..
WHAT IS A MASTER'S IN INFORMATION TECHNOLOGY? An informations systems and technology program will explore the relationship between the methods and algorithms used in information management. Key subjects include data analysis, network administration, and information security and data management. Read more here..
WHAT CAN YOU DO WITH A MASTER'S IN INFORMATION TECHNOLOGY? Professionals with a master's in information technology are prepared for many careers, including computer programmer, software developer, network architect, and network administrator. Read more here..
WHO SHOULD GET A MASTER'S IN INFORMATION TECHNOLOGY? This program is designed for students with an information technology background. Many applicants have an undergraduate degree in a related field. Read more here..
HOW LONG DOES AN INFORMATION TECHNOLOGY DEGREE TAKE ONLINE? Most information technology programs consist of 32 to 48 credits, which can be completed in about a year and a half by full-time students. Read more here..
WILL AN ONLINE MASTER'S IN INFORMATION SYSTEMS AND TECHNOLOGY PROVIDE ME WITH THE SKILLS I NEED TO ADVANCE MY CAREER? Most online master's in information systems and technology degree programs take a multidisciplinary approach. Some courses cover the algorithmic and technological processes that guide information systems, while others deal with the role of information management and technology within modern society. Many master's programs allow students to narrow the focus of their studies with a degree specialization in information security, database administration and other niche areas of information systems and technology. WILL AN ONLINE MASTER'S IN INFORMATION SYSTEMS AND TECHNOLOGY PROGRAM WORK WITH MY SCHEDULE? Online information systems and technology master's programs offer a flexible, easily accessible alternative to traditional college education. Students can download course lectures and readings, participate in virtual discussions with other students, submit written assignments, take exams and communicate with their professors on their own schedule. Current technology also enables them to study away from their home computer using a laptop, tablet, smartphone and other Wi-Fi-compatible devices. WHAT JOBS CAN I GET WITH MY MASTER'S IN INFORMATION SYSTEMS AND TECHNOLOGY? Those who graduate with an online master's in information systems and technology will be prepared for a wide range of professional roles. Tech-savvy students often find work as computer programmers, web developers or IT analysts. Other popular career paths include database and network administrators, network architects, information analysts and cybersecurity specialists. WHAT ARE THE BEST ONLINE MASTER'S IN INFORMATION SYSTEMS AND TECHNOLOGY PROGRAMS? Choosing a program is an incredibly personal decision, and only you can properly evaluate whether a target school's strengths match your educational needs. The following ranked list of schools should serve as a helpful starting point in your search for the best online master's in information systems and technology programs in the United States. If you are considering an online master's in information systems and technology, be sure to contact admissions specialists at different colleges and universities to learn more their about specific requirements and offerings. Based in Baltimore, Maryland, Johns Hopkins’ innovative approach to education accommodates both traditional and nontraditional students, and as an early pioneer in the distance education movement, the school is well-positioned to offer academically rigorous online degree programs. Hopkins's online master's in cybersecurity program is completely asynchronous but also interactive and engaging. Courses follow a traditional semester schedule and learning is primarily student-led, including several team-based assignments that provide unique networking opportunities. The school's master of science in information systems engineering is geared toward technical professionals and leaders in the tech industry. Available in both fully online and hybrid formats, this program offers a specialty track in cybersecurity, providing students with the skills to secure organizational data and protect networks from intrusion. All degree candidates begin their studies with three foundational courses in information systems and engineering, followed by three courses in the cybersecurity track, with options including ethical hacking, information assurance, critical infrastructure, and privacy engineering. The remaining four courses may be completed in either specialty or elective classes, and up to two electives can be taken from other departments with faculty approval. Students can also take up to two independent study courses, performing research on a topic with faculty supervision. The program includes an option for an information systems engineering capstone project, allowing students to complete a substantial independent project in an area of their choosing. This online master's degree in information security is designed for working students who attend part-time, though all courses must be completed within five years. Candidates who lack sufficient undergraduate training in math or programming are expected to take prerequisite courses in these areas, including a semester of either calculus or discrete mathematics and a course in a relevant programming language, such as C++ or Java. Cybersecurity students may also be required to take a course in data structures. Based in Evanston, Illinois, Northwestern occupies a main campus -- set on 240 acres overlooking Lake Michigan -- as well as two campuses in Chicago and Doha, Qatar. Northwestern's current enrollment tops 21,000 students, spanning 12 schools and colleges. Northwestern's nine founders set its foundation in 1850, fulfilling the university's mission by 1855 to drive higher education, with an inaugural class of just 10 students and two faculty members. Northwestern offers eight master's degrees, nine certificates, and individual undergraduate courses online. Students complete the online master's in information technology through the School of Professional Studies (SPS). Graduate students can take the master's in information systems specialties degree completely online or in person during evening classes on campus. Students typically take 1-2 courses every quarter. The program takes 2-3 years to complete. Students must complete 11 credits, including three core classes and six electives in a specialty area such as database and internet technologies, health informatics, or medical informatics. Learners also complete a final leadership class and a culminating capstone course, completed either as a group or individual project. Applicants must hold a bachelor's degree from a regionally accredited institution, as well as submit a resume or CV, two letters of recommendation, and a statement of purpose. Advisors strongly recommended a minimum of three years of work experience. Although not required, the program favor students with prior IT or computer science experience and high GRE scores. Northwestern provides an online orientation for SPS learners. Students can begin the program on one of four start dates each year and applications are accepted on a rolling basis. The admissions office accepts applications on a rolling basis and notifies candidates four weeks after the application deadline. Founded in 1900 by Andrew Carnegie, a Scottish immigrant who worked in a textile mill before making his fortune in steel, CMU caters to the working class in Pittsburgh, Pennsylvania. The university named for Carnegie merged with Mellon Institute in 1967. Today, CMU serves 13,961 undergraduate and graduate students. CMU graduates esteemed leaders in science, engineering, and the arts. Notable alums include the artist Andy Warhol and Kevlar inventor Stephanie Kwolek. One of CMU's seven academic schools, Heinz College offers the online master's in information technology. Students can complete the degree asynchronously in 2-3 years of part-time study, provided they take 1-2 classes each semester. The school allows up to five years to finish the degree. The master of science in information technology suits current data and tech professionals seeking career advancement in the industry. Students can choose an entirely online or hybrid program that incorporates evening courses. Students must complete 144 units in core and elective coursework. Graduates must maintain a minimum 3.0 GPA to earn their degree. The program requires that students fulfill a prerequisite in object-oriented programming before beginning the first class. Eligible applicants possess a bachelor's degree and a minimum of three years of professional experience. Students may choose one of four start dates throughout the year. Advisors host webinars and chat sessions for prospective applicants seeking additional information. Admissions provides a free online application. Applicants must submit transcripts, GRE or GMAT test scores from the last five years, two letters of recommendation, a resume, and an essay. Students may also submit an optional video interview and additional essay. NYU ranks among New York City's largest private colleges, with buildings in Greenwich Village, Washington Square Park, and Brooklyn. The school also hosts international campuses in Abu Dhabi and Shanghai, and additional study-abroad sites around the world. NYU inaugural class in 1831 graduated only 158 students. Today, the university serves a student population of more than 59,000. NYU's School of Professional Studies offers 16 master's degree programs, including the online master's degree in information technology, with a focus on business and tailored to working professionals. The program prepares graduates for management positions in IT through online, on-campus, or hybrid coursework. Full-time students can complete the master's program in two years. Part-time students may take up to five years to complete the degree. The program comprises 42 credits, including a concentration in database technologies, enterprise risk management, strategy and leadership, or systems management. Students conclude the program with a capstone, including a thesis, final project, or business plan with practical applications in the field of IT. Applicants must submit a bachelor's degree from an accredited institution, an online application and fee, a personal statement, a resume, two letters of recommendation, transcripts, and GRE or GMAT scores. The university accepts applications throughout the year. Chicago's Illinois Tech ranks among the nation's largest private research colleges. The school originated in 1940 as the result of a merger between Armour Institute and Lewis Institute. The main campus occupies the former Armour Institute. Specifically, the university marks the exact place where a "million dollar sermon" reportedly inspired Philip Danforth Armour, Sr. to establish Illinois Tech. Today, the university serves a student body of 7,164 and maintains two satellite campuses in Wheaton and Bedford Park. Illinois Tech offers online classes for working professionals. One of two programs offered through the Department of Information Technology and Management, the online master's degree in information technology focuses on the integration of management and technology, incorporating legal coursework through the university's Chicago-Kent College of Law. Students enrolled in the program must complete 10 courses, or 30 credits, and maintain a minimum 3.0 GPA throughout. The curriculum includes 12 optional specializations spanning software development, computer and information security, data management, and systems analysis. Graduate students can opt for part-time or full-time enrollment. Learners complete courses online asynchronously or through a combination of virtual and on-campus courses. Blackboard delivers course materials and provides discussion forums for online study. Students complete online classes in 16-week sessions, aligned with campus class schedules. The program admits applicants with a bachelor's degree in any subject from an accredited college. Applicants must also demonstrate a cumulative GPA of at least 3.0 and submit an application and fee, GRE test scores, a professional statement, and two letters of recommendation. Stevens is a small private school located in Hoboken, New Jersey, just outside of New York City. Founded in 1870, the school boasts a long history of educational leadership and technological innovation, which translates to a strong distance learning program. Stevens’s master’s in information systems prepares graduates for leadership roles in IT environments, training them to secure and protect legacy information systems. The 36-hour cross-disciplinary program is focused not only on technological skills but essential business management knowledge as well, with a core curriculum that explores organizational behavior, project management, and financial decision-making in addition to advanced information security topics. Three study concentrations are available in either business intelligence and analytics, business process management and service innovation, or project management. Students earning their cybersecurity master's degree online through Stevens benefit from an immersive learning platform that allows them to participate in real-time livestreamed lectures. While this does require some designated class times, assignments are completed asynchronously, allowing students to perform most of the program work at their own pace. The curriculum includes a business core of three courses along with six courses in information systems. Students also choose from three elective courses in their area of concentration, allowing them to personalize the degree to suit their professional aspirations. Admission to Stevens’ master's in information security online program is competitive, and while it is not strictly required, the school prefers one year or more of professional experience. Qualified students, however, may apply directly after earning a relevant bachelor’s degree. Applicants must demonstrate a 3.0 average in undergraduate study, as well as competitive GMAT or GRE scores. Stevens’s proximity to Manhattan gives students close connections to many Fortune 500 companies, which offer opportunities for internships, consulting positions, and even full-time employment after graduation. Founded in 1867, the University of Illinois at Urbana-Champaign features 15 schools and more than 150 programs at its Champaign campus, just two hours from the hub of Indianapolis. The university boasts 11 Nobel Laureates and 18 Pulitzer prize winners, serving a student population of 44,880 students, 11,413 of those enrolled in graduate and professional programs. The online master's in information technology, added in 2016 to the School of Information Sciences, comprises 40 credits in core and elective courses, selected with the help of an advisor. Students may choose one of four professional pathways in data science and analytics, privacy and security, information architecture, or information consulting. Students may complete an optional thesis and final project. The program takes between one and two years to complete. Students complete courses synchronously through Moodle, with the help of The Box cloud storage system. Each session lasts for 16 weeks, divided into two parts. Applicants must hold a bachelor's degree and submit a personal statement between 700 and 1,000 words, electronic transcripts, a resume, GRE or GMAT scores, and three letters of recommendation. Though not required, students with prior programming experience may waive out of a prerequisite computer programming class. Newly enrolled students must complete an online orientation course. Classes start in the fall and spring. Located just four blocks from the White House, GW claims rank as the largest college in the nation's capital, encompassing 20 schools and more than 26,000 graduate and undergraduate students. Founded in 1821 as Columbian University, GW boasts notable alums including Jacqueline Kennedy Onassis, J. Edgar Hoover, and Colin Powell. The university maintains three D.C. campuses: the flagship Foggy Bottom location, the Mount Vernon campus, and the Virginia Science and Technology campus on the Potomac River. GW's virtual campus offers more than 100 online programs. The online master's in information technology program began in 2013. Students can take online classes through part-time or full-time enrollment. Part-time students taking 3-6 credits a semester may complete the degree in 24-30 months, while full-time students taking nine credits each semester can take 18-24 months to earn the degree. Students must complete 33 credits, including seven core courses and four electives, in subjects like IS/IT strategy, enterprise architecture, and management of technology and innovation. Some students, depending on their level of experience, require additional foundations courses. The degree culminates in an integrated information systems capstone course. Applicants must hold a bachelor's degree from an accredited university. Though not required, candidates lacking a strong IT background may consider taking prerequisite technical courses. Applicants must submit an online application, transcripts, a resume, three letters of recommendation, GRE or GMAT test scores, and a statement outlining career objectives. Candidates with a bachelor's degree from GW may waive the application fee. The program accepts applications year-round, with fall and spring start dates. GW accepts up to six transfer credits from graduate-level coursework. Students can take part in online information sessions before enrolling. Established in part by chemist Edward Weston, NJIT emerged in 1880 as a prominent polytechnic university, thanks to legislation aimed at promoting industrial education in the U.S. Based in Newark and previously named Newark Technical School, NJIT's inaugural class in 1885 enrolled only 88 students. As of 2016, student enrollment at NJIT surpassed 11,000. NJIT features 128 undergraduate and graduate programs specializing in engineering, architecture, and computing sciences. The university offers two master's in information systems online degrees. The master of science in information systems comprises 30 credits, including a specialization in data analytics, business decision making, healthcare informatics, user experience design, systems analysis and design, web systems, or security and network management. The master of science in information technology administration and security also encompasses 30 credits, including 21 bridge credits, three required credits, and 12 electives in courses including forensic auditing for computing and computer security auditing. The university delivers online courses through Moodle, requiring students to complete assignments both asynchronously and synchronously. The instructor typically sets weekly deadlines, with occasional live discussions and required in-person group meetings. Graduate students spend an average of two hours each day completing coursework online. Sessions last for 15 weeks. Students may choose a hybrid course delivery format. Applicants may attend an in-person open house or webinar online before enrolling. Students must hold a bachelor's degree from an accredited college, an application, fee, transcripts, and one letter of recommendation. Students who earned a bachelor's degree outside of the U.S. must submit GRE scores. The program admits new students in the fall and spring semesters. Based in Waltham, Massachusetts (just outside of Boston), Brandeis is one of the top private colleges in the Northeast, and graduate students at the school enjoy the flexibility and convenience of a well-constructed distance learning program. The school’s master of science in information security leadership gives students an intimate, personalized learning experience, with small classes that average around 12 students. Courses are delivered across four 10-week blocks per year, and learning is asynchronous. Though degree candidates may take five years to complete a program, ambitious students can earn a master’s degree in two to three years. Brandeis's online master's degree prepares graduates for management roles in the increasingly important field of information security, training them to plan, oversee, acquire, and develop sophisticated systems for network security. This 30-hour online program equips tech professionals not only with the skills necessary to maintain sensitive data networks, but also to build business cases for investment in security infrastructure. This program curriculum includes six courses in advanced information security management and compliance, augmented by four elective courses that meet degree candidates’ career interests and allow them to enhance their professional skill set. Core courses include computer incident response and investigation, risk management, and security leadership strategies, while elective courses cover a range of topics, from cryptography and digital forensics to software security testing and cloud security. Applicants should hold undergraduate degrees focused on data communications, networking devices, or programming, or possess equivalent work experience. Students without relevant academic or work experience can contact Brandeis’ enrollment coordinator to learn about alternate admissions requirements. Enrollment advisors can also help students prepare for applications and connect with faculty and current students, gaining a better sense of the program before beginning courses. Once admitted, online students at Brandeis are paired with a student adviser who introduces them to the online learning platform and offers academic support up through graduation. With a flagship based in New Brunswick, Rutgers maintains campus locations in all 21 counties within the state of New Jersey. Rutgers encompasses 30 schools and colleges and offers 11 online master's degrees. Among Rutgers' leading online programs, the master of information degree with a concentration in technology can be customized to prepare students for specific fields in IT. Students choose one of four concentrations: data science, library and information science, archives and preservation, or technology information and management. Students conclude the degree with an ePortfolio capstone course. The program requires completion of 36 credits. Part-time students typically enroll in two classes per session. Students complete courses asynchronously, but with required regular weekly participation. Most online classes maintain an intimate feel with no more than 23 students per class. Classes begin on multiple start dates offered in fall, spring, and summer terms. Graduate students without adequate prior technology education must take an information technologies prerequisite course. Graduates of this program qualify for jobs in competitive intelligence, information architecture, data analysis, and digital archive management. The degree takes roughly two years to complete, depending on whether students enroll on a part-time or full-time basis. Senior enrollment coaches can provide students with specifics about their graduation timeline. Admission requirements include an online application and fee, transcripts, two letters of recommendation, GRE scores, a resume, and a personal statement. Based in Tampa, The University of South Florida occupies the area formerly known as Henderson Air Field's bombing range. The USF system comprises three campuses: USF, USF St. Petersburg, and USF Sarasota-Manatee. USF ranks among Florida's largest institutions, serving 50,577 students through 14 colleges and more than 40 graduate school programs. The online master's degree in information technology degree offered by the Department of Computer Science and Engineering encompasses 30 credits. The curriculum spans nine core credits and 21 elective courses. With permission from the graduate director, students can opt to incorporate an independent study, internship, practicum, or clinical practice as an elective. Students must maintain a minimum 3.0 GPA and pass a final comprehensive exam to earn the degree. Students complete online coursework through Canvas learning management system, where instructors post coursework, videos, calendars, and the syllabus. Both Florida residents and students outside of the state qualify for the online program. Students can also complete the degree in a hybrid format, through a combination of online and in-person classes. Applicants must submit a bachelor's degree in computer science, information technology, or a similar major, and transcripts demonstrating a minimum B-grade GPA in all undergraduate major coursework. The program also requires an online application and fee, GRE scores, three letters of recommendation, and a statement of purpose. Students may begin classes in the fall or spring. Admission also requires completion of six prerequisite courses in subjects including software engineering concepts for information technology and programming fundamentals for information technology. Among the nation's largest and most prestigious land-grant universities, Purdue encompasses 400 laboratories and 116 research centers, providing renowned science, math, engineering, technology, and aerospace programs. Founded in West Lafayette, Indiana in 1869, Purdue's famous alums include astronaut Neil Armstrong, comic Jim Gaffigan, entrepreneur Orville Redenbacher, and inventor David Crosthwait. Purdue offers two options for an online master's of information technology degree, with a concentration in business analysis or project management. Both fully online programs require completion of 34 credits. Courses last for eight weeks. Professionals suited to the program include project managers, lead systems engineers, and software team managers. The curriculum aligns with the teachings of the International Institute of Business Analysis (IIBA) and the Project Management Institute (PMI). The business analysis concentration emphasizes coursework in business, data analytics, and IIBA and PMI certification prep. The concentration in project management features coursework designed by the PMI. Students with PMP certification require only 30 credits to complete the degree. Students can complete the program in as few as 11 months or as many as five years. The concentration also includes a four-credit information technology business analysis certification. On average, students spend about 15-20 hours per week in the virtual classroom. Students must meet weekly assignment deadlines for all coursework, delivered asynchronously. Instructors can answer questions online or by phone. Applicants must hold a bachelor's degree with a GPA higher than 3.0. The program recommends that students possess a minimum of two years work experience and an educational background in IT. To apply, students must submit an online application, a statement of purpose, three letters of recommendation, a resume, and official transcripts. The program does not require GRE/GMAT test scores. Founded in 1851 in Tallahassee, FSU serves nearly 42,000 students through more than 275 degree programs over 16 academic schools and colleges. FSU offers undergraduate, graduate, certification, and elective courses online. 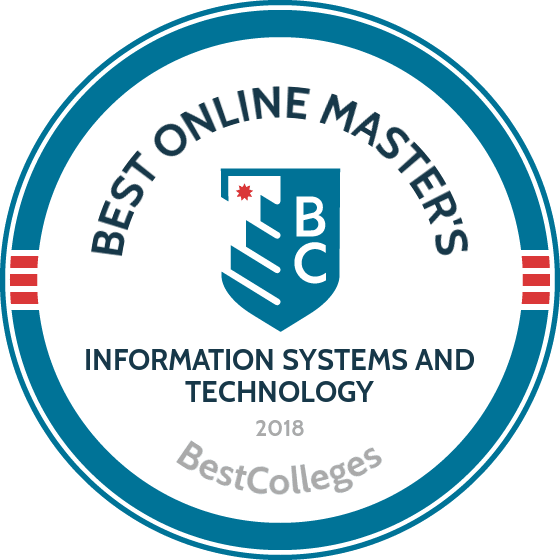 The School of Information, offering online programs since 1996, awards the 32-credit master's in information systems online degree. This master's program welcomes students from around the world and across the U.S. Blackboard Collaborate delivers courses synchronously Monday through Thursday, from 6-8 p.m. and 8-10 p.m. Some online courses require the use of a headset and microphone. Students can tailor the degree to their academic strengths and career objectives, through a specialization in technology and networking, user-centered design, web design, leadership and management, or large-scale data management. Students should expect attend an online class meeting at a scheduled time once a week. Most graduate students take two courses each semester and finish the program within two years, or six semesters. FSU permits students to take as long as six years to finish the graduate program. The program may require prerequisites for admission. Students must submit an online application, transcripts, a residency form (is applicable), and graduate test scores. FSU accepts applications in the fall and spring. The department prefers students with prior IT-related work experience and an educational background in IT. Candidates without prior IT experience can submit GRE or GMAT scores for consideration. Students must submit a School of Information supplemental application and university graduate application, with a fee, and a resume, as well as pass a graduate admission entrance exam. For more information, students may participate in an online orientation. Before 1969, the future site of UT Dallas occupied a modest cluster of research stations on a cotton field. The university eventually laid its roots in Richardson, the brainchild of the three co-founders of the Texas Instruments: Eugene McDermott, J. Erik Jonsson, and Cecil H. Green. The master's in information systems online degree encompasses 36 credits and takes 18-24 months to complete. Students can complete courses online or in the evenings, on campus. Learners can customize the program to their career goals with tracks in enterprise systems, cyber security management, IT consulting and services management, healthcare system, and business intelligence and analytics. The curriculum comprises 12 courses, including foundational coursework in business and IT, and elective options. The degree prepares students for managerial and technical careers in IT. The degree takes two years to complete, however students on an accelerated track can finish in one-and-a-half-years. Graduates qualify to sit for various certification exams, including the certified information systems auditor, certified information systems security professional, certified compTIA security+, and information security manager. The information systems department and the career management center in the Naveen Jindal School of Management offer internships to eligible students. All applicants must submit GRE or GMAT scores from the last five years, unofficial transcripts demonstrating a minimum 3.0 GPA, one letter of recommendation, a resume, and a personal objectives statement. Once admitted, students must arrange official transcripts by mail. Candidates can transfer up to nine credits, permitting courses were taken within the last six years and earned a B-grade average. UT Dallas accepts applications in the fall, spring, and summer terms. BU sits along the Charles River, in the heart of the Beantown, serving a student population of more than 33,000 across 17 schools and colleges. Founded in 1839 as the Newbury Biblical Institute, famous alums of the school later named Boston University include civil rights icon Martin Luther King, Jr. and radio DJ Howard Stern. BU began offering online programs in 2002. Students can complete the information technology master's degree online. The master's in computer information systems originated in 2004, with full-time working professionals in mind. The program prepares graduates for jobs in data analytics, security, computer networks, database management, health informatics, and IT project management. This master's degree encompasses 40 credits, or 12 courses. Graduate students must take five core classes and, if not declaring a concentration, five electives. Students can take between 18 and 24 months to complete this program. Blackboard online learning system offers web conferencing, virtual office hours, video lectures, and live discussions for online classes, each typically containing no more than 15 students. BU recommends that students spend at least 20 to 25 hours a week in each class. Classes last for seven weeks. The program offers start dates in January, March, May, July, September, and November. The Zoom platform delivers both asynchronous and synchronous courses. Students can access support services such as tutoring through the office of distance learning and the Smarthinking app. BU accepts applications year-round. Graduate candidates must submit an online application, fee, three letters of recommendation, a self-evaluation, resume, and electronic transcripts. To qualify for the master's program, students must hold a bachelor's degree from an accredited university and complete a prerequisite course in fundamentals of information technology. A small, private business college located in Waltham, Massachusetts, this university's namesake, Harry C. Bentley, taught at Boston University before establishing Bentley University in 1917. While the school's inaugural class graduated just 18 students, today the university serves 4,200 undergraduate and 1,000 graduate students. Bentley University offers 24 majors, many focused on business education, including the online master's in information technology. The program consists of six core courses, or 18 credits, centered on the foundations of IT. Required courses include data management and modeling, and enterprise architecture, though students earning a minimum B grade in these courses at an accredited college within the last five years may waive the requirement. Electives include business intelligence methods, and technologies and business process management. Students can take the 30-credit master's program on a part-time or full-time basis. Online classes run concurrently with traditional classes, in 10-week sessions. The program offers four start dates every year. Students can complete accelerated online programs in one year, provided they take a full course load. On average, the degree takes 18 months to two years to complete, as most learners attend part time. Bentley University gives students up to five years to complete the degree. Students may add an optional certification in business analytics. Interested candidates must submit an online application, fee, transcripts, two essays, two letters of recommendation, and a resume, as well as GRE or GMAT scores, unless eligible for a waiver. Transfer credits do not apply to foundational courses, though students with previous coursework may qualify to waive this requirement. Located less than an hour's drive from Los Angeles, California State University-Fullerton offers flexible part-time online programs. The school's online master of science in information technology prepares students for careers in either data science or IT management. The program also focuses on verbal and written communication skills. Aside from a mandatory on-campus orientation called Boot-up Camp, the program is available entirely online. Local students may also choose to attend in-person end-of-semester review sessions. The 30-unit program requires students to take two courses per semester, earning at least a 3.0 GPA minimum along the way. Students take courses all year long, allowing them to earn their degree in as few as 20 months. A cohort model allows students to progress through the program with the same group of peers with whom they collaborate on assignments and form networks. Master's students choose a concentration in either data science or IT management. In either concentration, students complete 15 units of coursework in business databases, statistics for data science, and programming concepts for information technology. Students then complete 12 units of concentration courses. Courses in the data science concentration include forecasting for analytical decision making, applied business regression analysis, and business data transformation. Courses in the IT management concentration include privacy and security, telecommunications and business networks, and electronic commerce. All students must also complete a three-unit capstone. Applicants must submit either GMAT or GRE scores, official transcripts, a letter of recommendation, a statement of purpose, a statement of leadership and creativity, and a resume. While not mandatory, the school prefers students who have at least two years of experience working in IT or business. Because the program accommodates part-time students only, distance learners who require a full-time course load for visa purposes are not eligible to apply. The school accepts students for admission in the fall semester only. Ranked #2 on U.S. News & World Report's list of best online master's in information technology programs, Virginia Tech's online master of information technology provides students with an interdisciplinary approach to IT. The program is a joint endeavor offered through the school's College of Engineering and Pamplin College of Business, allowing students to earn a unique, dual insight into the discipline. All IT courses are available fully online, although the school encourages students living in or near the school's main campus in Blacksburg, Virginia to take advantage of on-campus amenities. Courses are taught asynchronously but do require students to take scheduled exams and meet regular assignment deadlines. Full-time students take up to four classes per semester. The majority of students choose a part-time load of two courses per semester. The program allows students to complete their degree at their own pace, so long as they finish the program within five years. Most students earn their degree in two to two-and-a-half years. The curriculum requires 33 credit hours of coursework. Students take four foundational courses covering topics such as object-oriented analysis and design, leadership in tech-based organizations, and web-based application and ecommerce. Students then customize their degree by choosing elective courses in up to three modules of study from the following eight options: big data, networking, security, software development, business information systems, health information technology, decision support systems, and analytics and business intelligence. Applicants must have earned at least a 3.0 GPA in the final 60 credit hours of undergraduate coursework. The school does not require GRE or GMAT scores, but prefers students who have a working knowledge of Java, C, C++, or C#. Students who are not proficient in a programming language are still eligible to apply, but must acquire proficiency before enrolling in certain courses. As part of Virginia Tech's military-friendly culture, current or retired military members do not have to pay an application fee. Based in San Francisco, Golden Gate University offers its master of science in information technology management on campus as well as online. The program teaches business leaders how to advance into the world of IT. The program boasts a faculty of experienced IT professionals who have worked for some of the Bay Area's top tech companies. Graduates go on to work as IT managers, chief information officers, and chief technology officers. Distance students at GGU earn their degree entirely online through the university's online learning platform. Courses are asynchronous, meaning that students watch videos, complete projects, and participate in threaded discussions at their own convenience. Students local to the Bay Area may also opt to take hybrid or web-enhanced courses that involve some on-campus requirements. Online learners may occasionally take exams that require them to use either a certified testing site or an online proctor service. Students complete 33 units of coursework, including 24 units of required classes and nine units of electives. Learners who lack qualifying undergraduate coursework must take an additional six units of foundational coursework. Required courses include software engineering; budgeting and finance for IT managers; and security, privacy, and compliance. Electives explore areas such as enterprise architecture planning and project management for IT professionals. Students who wish to earn a concentration in business analytics can take an additional nine units in courses such as web and social analytics, communications through storytelling, and business intelligence. Applicants must possess either 30 credits of undergraduate IT coursework or three years of full-time work in the field of IT. Business or engineer managers with four years of professional work involving some IT experience are also eligible to apply. Students must prove proficiency in math, business, and writing. Located in Colorado's mile-high city, the University of Colorado Denver/Anschutz Medical Campus offers a variety of online courses through its user-friendly online learning platforms, Canvas and Zoom. The school's cutting edge master of science in information technology constantly adapts to meet changes in the industry while adhering to standards set out by the Association of Information Systems and the Association for Computing Machinery. The program prepares students for careers as computer programmers, business systems analysts, and chief technology officers. Students can specialize in enterprise technology management, business intelligence systems, or web and mobile computing. The school's master's in information systems online degree program is available entirely through the web. Students living in or near Denver can access the school's on-campus resources such as the experiential learning team, which helps students explore relevant internships and study abroad opportunities. The semester-based program requires 30 credit hours of coursework. Most students enroll on a part-time basis, taking an average of two courses per semester and completing the program in two years. The curriculum includes six hours of core courses, 15 hours of specialization courses, six credits of information systems electives, and three hours of free electives. Courses in the enterprise technology management specialization include emerging technologies and database management systems. Courses in the business intelligence systems specialization include business intelligence in healthcare and predictive analytics. Courses in the web and mobile computer specialization include website development practice and data warehouse administration. Applicants do not need to possess an undergraduate background in IT or professional programming experience. Potential students must submit GMAT scores, an in-state tuition classification form (if applicable), and transcripts. Students who have already earned a graduate degree can apply for a GMAT waiver. Headquartered in Greenwood Village, Colorado State University's Global Campus is an online school dedicated to providing accessible web-based degrees to working professionals. The school's online master's in information technology management focuses on the application of global perspectives and leadership tools in the field of IT management. The program boasts a faculty with field experience and special training in online instruction. All courses follow CSU-Global's 3-P model of purposeful, participatory, and project-based curriculums. The school offers year-round online courses with start dates at the beginning of each month. Because every course is available every term, students earning their online master's in IT can complete their requirements as quickly and efficiently as their schedules allow. Asynchronous courses allow students to access their assignments on their own time. Distance learners still receive one-on-one instruction from faculty members. The master's in IT management consists of a 24-credit core curriculum. The school recommends that students take courses in a particular order, starting with fundamentals in quantitative analysis, moving to IT management, and ending with business continuity and disaster recovery. The program culminates in a final capstone course on information technology management. In the capstone, students apply what they've learned by identifying an organization's IT challenge and suggesting a plan of action. Students can choose from one of sixteen areas of specialization. Sample specializations include healthcare administration, international management, and criminal justice leadership. Applicants should possess at least a 3.0 undergraduate GPA. Potential students must submit a statement of purpose and professional resume. They then complete a 30-minute SmarterMeasure assessment that determines readiness for online graduate school. Rensselaer Polytechnic Institute was the first technological research institution in the U.S. Today, the school's primary campus is in Troy, New York, with two additional campuses in Hartford and Groton, Connecticut. The school offers a part-time blended master of science in information technology program that includes classes both online and on Rensselaer's three campuses. Because the program requires some face-to-face participation, it is most appropriate for students living in or near Troy, Harford, or Groton. All online courses are synchronous, meaning students participate in real-time online discussions and lectures at the same time as their peers. Students develop a customized plan of study that consists of ten IT courses, five core courses, three concentration courses, an elective course, and a capstone course. Of these classes, at least six must be at the 6000 graduate level. Required courses include database systems, software design and engineering, and human computer interaction. Students earning their information technology master's degree online choose a concentration in either data science and analytics or web science. Students in the data science and analytics concentration learn how to use data analysis to enhance decision making. The concentration explores subject areas like multivariate analysis, advanced statistical computing theory, and data mining. Students in the web science concentration work alongside faculty member Dr. James Hendler, a pioneer of the semantic web and a globally esteemed web researcher. The concentration analyzes new technologies and developing trends in escience. Students apply their knowledge of web science to help organizations and businesses leverage the internet. Applicants must submit GRE or GMAT scores, a resume or CV, official transcripts, and a personal statement. Potential students also fill out an IT background evaluation form that helps the school determine what prerequisites the student may require. Located in the vibrant city of New Orleans, Tulane University offers a select number of online master's degrees. The school's master of professional studies in information technology management prepares students for management roles in the world of IT. The program is ideal for those who want to work with cyber network security and enterprise architecture. The program is offered entirely online and includes 10 courses: seven core courses and three electives. Students can complete a maximum of two of these courses through an independent study. Core courses include legal issues in computer technology, the business of information technology, and two enterprise software courses in software and hardware. Elective courses include healthcare informatics, IT project management, and cyber threats and homeland security. The program does not require a thesis or capstone project. Applicants must submit an official transcript demonstrating a 3.0 GPA or higher. Potential students also write a statement describing their IT background and how Tulane's online master's of information technology will help advance their career goals. The program is most appropriate for those who possess a BA or professional experience in math, computer science, engineering, or statistics. Students with no an academic background in IT or a related field must demonstrate relevant professional experience. Applicants who have taken some computing courses must have three to five years of professional experience while those who have not taken a computing course must have five or more years of experience. Students can transfer up to nine credit hours of graduate coursework to Tulane as long as they earned the credits within the past five years and received a grade B or higher. Tulane is military friendly and will review military training transcripts to determine if any experience may apply toward elective credits. When appropriate, the school also awards elective credits to veterans, paramedics, firefighters, and police officers. Students who wish to earn their master of science in management information systems can do so either entirely online or through a combination of online courses and face-to-face courses on the University of Illinois-Springfield campus. The program blends concepts in information technology and business management to prepare students for leadership roles in the IT field. Students communicate with peers and faculty members through live, web-based video conferencing and email. Courses involve both asynchronous assignments and real-time discussions. Instructors determine the balance between asynchronous and synchronous requirements on a course-by-course basis. Students earning their master's in information technology online take 36 credit hours. Core courses include systems analysis and design, data communications and networking, and business process management and innovation. Students earn the remaining six credits hours through a either a thesis or a capstone project and seminar. Applicants who do not possess a 3.0 minimum GPA or a graduate degree from an accredited university must submit GRE or GMAT test scores. Students must possess the following academic background in order to apply: two semesters of accounting, one semester of statistics, one semester of production/operations management, one semester of college algebra or math, and proficiency in a high-level programming language. Competency in Java, C++, COBOL, C, Fortran, Visual Basic all count toward the programming language requirement. In 1995, 19 U.S. governors collaborated to create a new kind of learning institution that measured educational progress according to learning rather than time. Today, Western Governors University provides online degree programs to students around the world. The school's online master's degree in information technology management provides a flexible, affordable degree option for students pursuing careers in IT management. Most students finish the online degree program in two years or fewer. Some learners finish in as few as six months. WGU is unique in that it allows students to pay a flat per-semester tuition rate, meaning students can take as many courses as they are able to complete in a semester without paying additional fees. Semesters are six months long. At the end of each semester, students meet with an advisor to assess their progress and update their degree plan. Distance learners at WGU advance through coursework entirely at their own pace. Students complete a course when they pass either a performance assessment or objective assessment. Performance assessments usually include a project or paper, while objective assessments rely on multiple choice, short answer, and matching questions to determine a student's competency in a subject matter. WGU's online program consists of the following subject areas: IT management; technical communication; power, influence, and leadership; cyberlaw, regulations, and compliance; risk management; networking; disaster recovery planning, prevention, and response; technological globalization; and project management. Each subject requires two to three competency units of coursework. Graduate students must complete at least eight competency units per term, but can complete more depending on their preferred pace. All students must complete a capstone course. Applicants must possess a BA in information systems or IT, at least three years of relevant IT professional experience, or a high-level certificate such as CCNA, CEH, CISSP, or MCSA. Based in Fairfax with additional campuses in Arlington and Prince William county, George Mason University is the largest research university in Virginia. The school also operates an international campus in Korea. GMU's master's in applied information technology with a concentration in cyber security prepares students for careers in cyber-human interactions, big data analytics, and data analytics in social media. Offered through the Volgenau School of Engineering, the master's in information technology is available fully online with students enrolling on either a full-time or part-time basis. The majority of courses follow an asynchronous format so students complete work and watch lectures at their own convenience. Course exams dates and deadlines still apply, and many courses require weekly or biweekly assignments, exams, or blog posts. In addition to Blackboard, instructors rely on social media, wikis, blogs, email, and discussion boards to deliver information, communicate with students, and hold class discussions. The average online student logs in four times per week and spends roughly eight to 12 hours per course. The program requires 30 to 36 credits of coursework, including 12 credits of core requirements and 18 credits of concentration courses. Core classes include: algorithms and data structures essentials; fundamentals of computing platforms; database management systems; and information: representation, processing, and visualization. The cyber security concentration explores subjects such as secure software development, incident handling, and penetration testing. The school prefers applicants who have between five and 12 years of relevant professional experience, a working knowledge of the IT field and quantitative methods, and the drive to become a leader. Students must also possess at least a 3.0 GPA in their final 60 hours of undergraduate coursework. Applicants submit letters of recommendation, a resume, a statement of goals, and official transcripts. Located in St. Louis, Missouri, Webster University boasts a globalized and inclusive curriculum and a student body from over 100 countries. In addition to its main campus in Missouri, the school maintains campuses in Europe, Asia, Africa, and North America. The university offers a master's in information technology management that is available in a blended format, fully online, or on the St. Louis campus. Webster's online courses are asynchronous but not self-paced. Classes follow a set schedule with weekly assignments, discussions, and deadlines. Outside of these restraints, students can structure their coursework to meet their own schedule. Some courses do not use a lecture format and instead operate solely through discussions. Students access discussions and assignments through Webster's online learning management system, WorldClassRoom, which connects learners from around the world. Webster's master's degree in IT management requires 36 hours of coursework. Students take 27 core courses and nine electives courses. Core courses include organizational behavior; systems analysis, design, and implementation; and information and communications security. The program concludes with a final project in IT management. The school considers applicants on a rolling basis and encourages students to apply the semester before they wish to begin taking courses. Applicants must possess at least a 2.5 GPA in their undergraduate courses. Those with a GPA between 2.0 and 2.5 can enroll on a conditional basis. In order to advance to candidacy, all students must earn at least a B- in their first 12 credits of graduate coursework. Located in a Salt Lake City, the University of Utah offers a variety of online degree programs for distance learners, including a master of science in information systems online. Students can complete the 30-credit-hour program on a part-time or full-time basis, graduating in as few as three semesters or pacing their studies over two years. Required courses include data structures and Java, systems analysis and design, and database theory and design. Students take 18 credit hours of core courses and 12 credit hours of electives. Students without an undergraduate background in IT must also take a three-credit-hour introduction to information systems during their first semester. The school offers new elective courses each year. Current electives include IT security, project management, and data analysis and decision making. The program culminates in a capstone. Online learners attend class at the same time as their on-campus peers and communicate with their classmates through webinars and live conferencing. Outside of synchronous collaboration on group assignments and discussions, students can complete their coursework at their own convenience. Online students also have access to a range of career services including live, personalized career coaching and up-to-date job databases. Applicants must submit unofficial transcripts showing they received at least a 3.0 GPA in the final 60 credit hours of undergraduate coursework. Students must also submit either GRE or GMAT scores, a resume, letters of recommendation, and a statement of purposes describing their career goals and interest in technology. If necessary, students may also compose an essay addressing any weaknesses in their application materials. The school accepts applications all year, but online students can only begin the program in the fall. The University of Alabama at Birmingham's school of business now offers three online master's programs, including an online master of science in management information systems. Designed by an advisory council of IT professionals, the program's curriculum prepares students for careers in information systems. Students choose a concentration in either cyber security management or IT management. UAB’s program has been rated highly by the National Security Agency, the Department of Homeland Security, and the Princeton Review. The 30-credit curriculum includes 18 hours of core requirements and 12 credit hours of courses within their concentration. Students who do not possess an undergraduate background in management information systems or a similar field must first take a six-credit-hour bridge program involving an introductory course in networking and computer programming and a foundational course in systems analysis and database. Core courses include social media and virtual communities, data science for business, and IT governance and management. Courses within the cyber security management concentration include cyber attacks and threat mitigation, digital forensics, and information security management. Courses in the IT management concentration include web analytics and technology planning. The fully online program features an asynchronous class format that allows students to complete their assignments on their own time. Full-time students can earn the master's in information systems online degree in as little as one year, while part-time students typically earn the degree in five semesters. Applicants who do not possess a bachelor’s degree in IT or IS may submit proof of relevant professional experience or certifications. Students must also submit a GMAT score of at least 500. Applicants who do not possess qualifying GMAT scores must submit qualifying GRE scores, proof of five years of relevant professional experience, or another graduate degree. The school also requires a resume, personal statement, and references from two people who can attest to the student's experience in IT/IS. Qualified candidates can also apply for scholarships. Though it’s based in small-town Ames, Iowa, ISU is a leader in cybersecurity, partnering with the NSA in its efforts to develop best practices and innovations in the field. The school’s Department of Electric and Electronic Engineering offers two options for aspiring tech professionals in information security, with an online information assurance master's available as either a master of engineering or a master of science. Both program options require 30 credit hours of study, built around an 18-hour core curriculum focused on networking, security practices, information warfare, and computing ethics. MS degree candidates may choose from a thesis option with six credit hours of research, or a non-thesis option with a creative component and capstone project. Remaining degree requirements are completed from a list of interest-based electives, and students must also complete a comprehensive oral exam at the end of their degree. Students in the ME program complete all degree requirements via coursework, including a capstone project prior to graduation. ME students also complete six credits of research, but are not required to prepare a thesis. The school makes distance learning available via streaming video of in-class lectures, and all study is asynchronous, allowing students to choose when they view course material. For students interested in trying out to program before committing fully, ISU allows up to nine credits (typically three courses) to be taken as a non-degree seeking student, giving students the opportunity to begin their studies even if they are not yet formally admitted into the online master's in cybersecurity program. These credits count toward the degree if students decide to continue the program. For students looking to save on tuition, ISU also offers CyberCorps Information Assurance Scholarships in partnerships with the National Science Foundation. These funds are available to qualified graduate students and augment degree studies with leadership skills training and an internship. CityU is a private school in Seattle, Washington that’s uniquely focused on the educational needs of nontraditional students. Offering both bachelor’s degree completion programs and professional graduate degrees, the college structures its educational requirements for working adults, with convenient online programs that offer flexible class schedules through fully asynchronous study. (Local students can also take advantage of the school’s hybrid courses, taking a mixture of online and campus classes as it suits their availability.) This fully accredited online cybersecurity master's offers two concentration options: cybersecurity environment or information security audit. Students aiming for business management roles may find CityU’s master of science in information security to be a good fit. This multidisciplinary degree program is designed to deliver the advanced cybersecurity management skills and business acumen necessary for success in an organizational environment, and graduates are equipped to manage system infrastructure, develop policy, and implement information security across a wide range of industries. The program’s 39-hour curriculum is comprised of five core courses that explore cybersecurity administration and privacy issues within organizations and businesses. Beyond the core curriculum, students complete their degree requirements with specialized study in their area of concentration. The cybersecurity environment track includes courses in intellectual property and espionage, cybercrime, cyber warfare, and e-government, while the information security audit path covers topics in auditing techniques and technology infrastructure maintenance. Regardless of concentration, the program culminates in a capstone project that brings together core program principles and synthesizes student learning. Given its focus on professional education, it’s no surprise that CityU offers a range of both academic and career services to online students. The Online Career Management Community offers virtual career counseling, assisting students and alumni with job searches, resume building, interview skills, and career planning. Online students also gain access to a range of career webinars offered through the CityU Alumni Association. Ranked as one of U.S. News & World Report's top 100 online graduate business programs for 2018, the master of science in information systems at Mississippi State University covers a broad spectrum of subjects including systems analysis, database design, information technology, and business telecommunications. The master's program requires 30 hours of coursework, including 18 hours of required courses and 12 hours of elective courses. Core courses cover topics such as business telecommunications, MIS administration, and advanced database design administration. BIS elective options include microcomputers, bus programming with COBOL, and BIS security management. All students take a set of prerequisite business courses before beginning core coursework. These classes include accounting, business statistics, economics, financial management, and marketing. Students with a background in business may be exempt from some prerequisite classes as long as they earned a grade B or better in an equivalent course. In addition to knowledge of business and IS, the master's in information systems online degree also stresses skills in oral and written communication. Distance learners learn how to communicate using nonverbal cues, visual aids, and persuasive techniques. In written papers, students learn mechanics, formatting, style, and organization. These skills are critical for students pursuing careers in management or business. Applicants must submit official transcripts, GRE or GMAT scores, a resume, three letters of recommendation, and a statement of purpose. Students may apply to begin their studies in the fall, spring, or summer semester. Oklahoma State University, located in Stillwater, is a public school that offers the same quality of education to distance learners that on-campus students experience. Among OSU's notable programs is the master of science in management information systems. Students explore theoretical content through problem-based learning, which ensures that graduates are skilled and able to fulfill the needs of market demand. Coursework addresses information systems in addition to cutting-edge techniques regarding business, technical, and leadership management. Coursework includes advanced systems analysis and design, which requires students to analyze and design a business information system. Students use current techniques and tools to outline an action plan, create a design layout, construct a system, select software packages, and develop a maintenance plan for an information system. Elective coursework allows students to focus on data science or application development. OSU requires students to complete a practicum in business information systems. If students are unable to fulfill this internship, another course will be required as a substitute. This program is taught entirely online and requires distance learners to complete 33 credits to graduate. Students are provided with a syllabus at the beginning of the semester, which includes all assignment, test, and group work due dates. Coursework is available at any time through Brightspace, OSU’s online classroom environment. OSU follows a traditional semester structure and requires graduate students to apply by the fall deadline. Students must have a minimum GRE score of 305 or a GMAT score of 550. Students must have at least a 3.0 GPA. Transfer students are welcome to apply. Transfer credits are evaluated when students submit their plan of study. Indiana University is a public school that is heavily grounded in the sciences. Students interested in information systems and technology can enroll into the master’s in information systems online degree. This 30-credit program is a combination of technology and business courses. Graduates understand information systems and can apply their knowledge in business settings. Core coursework includes topics such as supply chain management, which is spread across four courses: sourcing, distribution and inventory management, enterprise operations and planning, and project management and process analysis. These classes teach students how to maximize customer value and establish sustainable competitive advantages for organizations. Quantitative analysis expands on basic statistical and mathematical models, which assist in probabilistic decision-making or regression analysis. Students will also explore the design of critical systems, computer vulnerability, and concepts of security. IU focuses on learning by doing, which is why the online IU environment is very interactive. Students engage in web-based meetings through software such as Zoom, which allows them to interact with peers. Learners also participate in weekly discussion forums. This program is taught completely online. IU provides distance learners with free tutoring, academic advisers, financial literacy advisers, and technical assistance. Supplemental instruction is available for students who require additional information to master content. IU requires graduate applicants to have a minimum GPA of 3.0. The GRE is required and scores must be above 280. Located in Worcester, Massachusetts, Clark University is a private school that focuses on research. With access to advanced technology and information, students who are interested in information systems should consider Clark’s master’s in information technology online. Information technology coursework includes contemporary issues in IT, which exposes students to trends and the potential impact these issues can have on various organizations. Students also learn about information systems analysis and design, which exposes students to the most current technological capabilities while examining future possibilities. The curriculum also focuses on important principles in business such as ethics, change management, leadership, communication, and legal considerations. Students have the option to choose from a concentration in cyber security or IT leadership. The cyber security concentration includes courses such as security architecture and design as well as cyber security warfare and risk management, which prepare students to defend sensitive organizational information. The IT leadership concentration teaches students IT-specific leadership strategies and focuses on intervention, mediation, and negotiation. Both concentrations include an internship course. Online students are assigned individual academic advisers and have access to financial aid advisers. Library resources are available online at any time. Librarians assist students during normal business hours. The IT help desk is available to assist students students with any technical problems over the phone; tutorials are available on the web as well. This program contains 12 courses, and start dates are available in January, July, and September. Students who have at least three years of experience can apply for professional experience credit. Up to two courses can be waived. Dallas Baptist University is a Christian university located in Texas. The school is known for its large population of commuter students. Students interested in technology systems can enroll into the University’s master of business administration with a concentration in management information systems. The program requires students to earn 36 to 48 credits. The core curriculum includes foundational information such as creative problem solving marketing decisions, which teaches students to explore relationships between marketing decisions and the creative process. Students can critically think about innovative methods to solve organizational challenges. Courses in business ethics have students examine relevant business principles and standards.The information systems concentration targets vital technological information that students will encounter in their future positions. Database management systems teaches students how to effectively and efficiently develop and manage database applications. This course focuses on database concepts, practices, and emerging trends. This program is offered 100% online with an interactive classroom environment. Students receive syllabi at the beginning of their courses, which outline due dates for assignments, discussion posts, and exams. The DBU writing center is free. While students can get their essays edited, they can also receive assistance with research and documentation. The DBU library also provides information and assistance with research. The online catalog provides students with access to many journals, books, magazines, and articles. To apply, students must have a minimum GPA of 3.0. Transfer students are accepted. Previous coursework must have been completed with a minimum GPA of 3.0 and taken within six years of enrolling into this DBA program. If credit is not accepted, students may petition for approval of transfer credit. The University of Arkansas, located in Fayetteville, was founded in 1871. The university has grown a reputation for having one of the highest levels of research activity, which is reflected by the university’s academic initiatives. The University of Arkansas' online master’s in information technology prepares graduates for business careers. Students work with data using the latest technology. Through coursework, such as enterprise systems, students learn to implement systems within organizations. Students explore supply change management systems, business processes, ERP usage, and ERP architecture. Fundamental analytics teaches students to assess estimation models, visualization, and survey analysis. Business principles are a vital component of the program as well. Students learn about quantitative aspects of management that are needed to make effective organizational decisions. Students can choose between two concentrations: enterprise resource planning and enterprise systems management. This program requires students to earn 30 credits and takes 21 months to complete. Learners must be able to fulfill a one-day, in-person requirement that takes place each month on a Saturday. Most online courses are self paced and last 12 weeks. Otherwise, virtual classes follow a traditional format, where students are provided with a syllabus at the beginning of the semester that includes deadlines. Most exams require a proctor; the University of Arkansas uses ProctorU. Exams must be scheduled three days in advance. Students are assigned to an academic record specialist, who serves as their primary contact when experiencing issues. Online students pay in-state tuition, and there are over 20 start dates for self-paced virtual courses and traditional semester enrollment for other courses. Students must have a minimum 3.0 GPA, and if a student has at least five years of professional experience, the GMAT may be waived. Marist College is located in Poughkeepsie, New York. Students with limited flexibility who are interested in a balanced educational experience between information technology and business can enroll into the online master of science in information systems at Marist College. This program creates professionals who become organizational change advocates, innovators, and leaders. Students can choose between three concentrations: information systems management, business analytics, and computer networks and security. Students on the information systems management track qualify for systems analyst, designer, and project manager positions. Learners take courses such as systems and information concepts in organizations, which teach system perspective for the information field along with system organization base knowledge. This helps learners understand the nature of organizational information systems and their natural flow. The business analytics concentration is designed to develop professionals who can access and manipulate data. Students gain knowledge of the best techniques for extracting information from data to predict upcoming trends. Graduates with this concentration will be able to become data architects and database administrators. The computer networks security concentration prepares students to be competent investigators who can troubleshoot technology associated issues involving network security. Students take courses in information analysis and systems design. CNS graduates qualify for internet engineer and IT administrator positions. All concentrations require a capstone course. Online courses mirror traditional classrooms; students take notes on lectures, participate in discussions, and take exams. Marist College uses the iLearn learning management system, which allows students to access course material at any time. Some courses require meeting at specific times. This program requires students to earn 36 credits, and classes are accelerated. Winter courses last four weeks, and the remaining terms follow eight week schedules. Applicants must have a minimum 3.0 GPA. Montclair State University, located in New Jersey is recognized as a public research school. Students have many opportunities to gain hands-on experience. Montclair’s online master of science in information technology prepares students for many careers. Organizations need professionals who possess advanced knowledge about the research, design, development, and management of applications for communication technology. Core coursework includes topics such as human-computer interaction, which teaches students about science-based models and development associated with user interface design. Students use the design process to develop quality user interfaces. This program also explores cyber law. Students learn substantive and legal principles of internet technology. Theories of intellectual property are examined in addition to criminal law and jurisdictional issues that relate to commerce. Coursework also focuses on various techniques of communication. This program also includes a concentration in applied information technology. Advanced courses focus on database systems and software engineering. At the end of the program, students must complete an industry internship. There are no in-person requirements for this program. Classes are offered in eight week sessions, and the program consists of 33 credits. Distance learners are provided with a graduate program coordinator who ensures students are meeting personal and program goals. Online students have access to multiple professional networks and a virtual learning community. The library offers a vast selection of supplemental resources, and the writing center is available during normal business hours. Technical support is accessible around the clock. Online student tuition is the same as in-state tuition. GRE requirements are waived for students with a 3.0 GPA or higher. Liberty University is a private, Christian school located in central Virginia. Since 1985, Liberty has offered online programs to students who need a flexible education. Students interested in working with computers can enroll into Liberty University’s online master’s degree in information technology or Liberty’s master of science in information systems. The MS in information technology focuses on the transfer, storage, and accessibility of technological information. Students on this degree path focus on technology that is used in information systems rather than the system itself. Featured courses, such as secured software engineering, teach students advanced skills to compose secure software that organizations can depend on. Students also explore network architecture and design, which equips students with an understanding of network model analyses that strengthens business strategies in evolving environments. Graduates of this program will qualify for cybersecurity, network administration, or infrastructure management positions. Liberty’s MS in information systems examines platforms that manage information or technology products. Coursework includes information forensics, compliance, and risk management. Students learn to identify information assets while managing and implementing policies and guidelines to ensure confidentiality. Graduates who choose this program are prepared to become actuarial scientists and computer security auditors. Both programs include an integrated capstone. Courses typically follow an eight week schedule on traditional semesters. This program can be completed within 12 months. Some classes require students to attend in person for one to two weeks. Both concentration require students to earn 36 credits, and there are eight start dates available throughout the year. Transfer students are welcome to apply. Up to 50 percent of qualifying program credits can be transferred. Founded in 1866, Towson University is a suburban campus located near downtown Baltimore. Students interested in the function of information systems and technology in professional settings can enroll in Towson’s online master’s in information technology. The program is designated by the Department of Homeland Security as a center of excellence in cyber operations. Students learn how to design, construct, implement, and manage informations systems. Students must complete one or more of the six graduate certificates associated with this program, which includes: database management systems, information security and assurance, information systems management, internet application development, networking technologies, and software engineering. All certificates can be obtained in less than a year. Core coursework provides students with a firm foundation in information technology through classes such as case studies in database management systems and information systems vulnerability and risk analysis. Students are encouraged to complete all of them to increase their marketability. Online students use Blackboard to access course materials, which are available at all times. Students follow course syllabi provided at the beginning of the semester, which outlines due dates for all assignments, discussion posts, and exams. This program requires students to earn at least 33 credits. To be considered full-time, students must register for nine graduate credits each term. Towson allows students to complete the programs part-time; they must be registered for three to six credits to qualify. Towson follows traditional semesters, and this program accepts new students at the beginning of each term. Applicants must have a minimum 3.0 GPA or a minimum GPA of 2.75 for conditional admission. Transfer students are welcome. Transfer credits are evaluated by submitting a transfer petition form. Located in Nashua, New Hampshire, Rivier is a nonprofit school that takes a hands-on approach with their business program curriculum. Students who would like to excel in business settings while also learning about technology and information systems can enroll in the school's master of business administration with a concentration in information technology. Core coursework prepares students to interact with organizations worldwide. Courses such as global finance for managers teach principles of asset valuation and global market financing. This program also focuses on pertinent decision-making skills in courses such as risk management and decision making and operations and quality management. Students examine advanced analysis concepts, tools, and methodologies to determine the best course of action when uncertainty is present. Students also explore problems and practices of operations management. By discussing industry issues, students apply operations strategy, design, and capacity planning to develop viable solutions. The technology concentration examines topics such as database management systems, which provides familiarity with fundamental concepts of database systems. Students focus on establishing relationships and connections between databases, statistical analysis, and machine learning. Distance learners can expect to participate in discussion boards and group activities. Assignments, exams, and other deadlines are available at the beginning of each course in a syllabus that can be accessed through the Rivier online learning system. The university's programs follow a traditional semester structure. Multiple program start dates are available. The degree consists of 36 credits and can be completed in two years. Accelerated courses are offered in seven week increments. Applicants must have a minimum GPA of a 3.0. Students who do not meet the minimum GPA requirement can still apply. The admissions office evaluates these applications on a case by case basis. Transfer students may also apply. The University of Maryland Baltimore County is a public school that emphasizes science, information, technology, and public policy. Students interested in uncovering solutions to dilemmas in technology and information systems should consider UMBC’s information technology master’s degree online. This program offers the same hands-on experience that on-campus students receive. The information management systems course introduces students to information systems in business, how they operate, and ways they are used in decision-making and strategic planning of organizations. Students are also required to take advanced classes, which include readings in advanced structured systems design. This course emphasizes strategies associated with analysis and design. Students are expected to produce logical methodologies for managing complex information systems. Other notable advanced options include readings in human-centered computing research, which has learners analyze cognitive and software concepts derived from human-centered thinking. Theories of memory, problem solving, and linguistic comprehension are explored. Course outcomes include the ability to accurately conduct independent research for interactive software design. Students have the option to complete a master’s thesis, which must be approved by an adviser and presented in person. UMBC uses Blackboard, an online learning management system. Students receive a course syllabus, which contains all due dates. Assignments, exams, group work, and discussion boards are completed through Blackboard. Students have an academic adviser who assists with progress and support. Librarians are available online to assist with research questions. This program requires 30 to 34 credits and can be completed in three years. Students can apply at the beginning of the fall, spring, or summer terms. Students must have a minimum GPA of 3.0 and are not required to take the GRE or GMAT. Applicants who have at least a 2.75 GPA can still apply. Additional documentation is required. Founded in 1869, the University of Nebraska is the oldest school in the state. Students in the master of science in education in instructional technology program explore ways to communicate, operate, and record data about information systems. Students also develop decision-making skills that are often applied in organizational change by instructing other professionals. For example, the developing web-based educational environments prepare instructional technologists to instruct other professionals on how to evaluate nonlinear web-based projects. Other courses such as system administration provide students with foundational information needed to manage servers and users, while computer security focuses on computer encryption, security protocols, and attack prevention. Distance learners engage in an interactive classroom experience. Both professors and classmates can be contacted at anytime through the online learning system. Students also participate in discussion boards and group chats. Due dates for all coursework is outlined on the syllabus at the beginning of the course. Online learners have access to academic advisers who keep track of student success. Advisers are also available to help students navigate resources. Librarians are also available to assist with accessing digital resources. This program consists of 36 credits. Applicants must have a minimum GPA of 2.75. Transfer students are welcome to apply. At least 50 percent of the coursework must be completed through the University of Nebraska. Students must submit coursework to the admissions office for approval. This program has fall, spring, and summer start dates. Founded in 1856, Auburn University is a suburban school in Alabama. Research is an important mission for this university and a primary focus deals with uncovering solutions to current dilemmas pertaining to technology that impact national quality of life. Students who want to become leaders of technology in organizations can enroll into Auburn’s master of science in information systems online. This program has three required courses. Students may choose the remaining credits based on a concentration area. Auburn offers a concentration in oracle database, risk and information assurance, and security. Coursework includes predictive modeling, which teaches students foundational information regarding linear models. Students also focus on advanced topics such as data mining, neural networks, clustering algorithms, and web mining in business settings. Students experience real-world application by examining current issues in information systems. Learners become familiar with emerging technology issues, vertical portal relationships with information systems, and the impact of information systems in professional settings. Managerial skills are also developed through electronic commerce. Students investigate business activities conducted through the internet, which include buying and selling, stakeholder collaboration, customer service, or social networking. This program requires 30 credits and takes two to three years to complete. Distance learners have academic coaches who examine student study habits and concerns to formulate action plans. The office of academic support has a peer tutoring program, which also encourages students to build relationships with each other. The Auburn supplemental instruction is a program that partners struggling students with a peer who successfully passed the same course during the previous semester. Students can choose between fall, spring, and summer start dates. Applicants must have a minimum 3.0 GPA. Students will need to submit GMAT or GRE scores. The University of Cincinnati, founded in 1819, is an urban public school in Ohio and it is known for its online graduate programs. Cincinnati’s master of science in information technology online offers students an engaging, hands-on experience. The program offers four concentration areas: cybersecurity, IT infrastructure, social applications, and game development. The cybersecurity concentration focuses on the relationships cybersecurity theories have with businesses and society. Students also analyze how threats and vulnerabilities impact the risk percentage of professional environments. The IT infrastructure concentration introduces the process of planning, creating, and managing resilient systems. Social application students explore popular means of digital communication while developing tools to facilitate new ways to utilize the technology. Students learn about tools, devices, and operating systems for mobile applications with the objective to develop their own applications. Game development students examine what influences learning and simulation through case studies. Students apply learning theories and created games for simulation and educational purposes. Game developer students also focus on networked game development issues such as 3D programming and multiplay architecture. Students complete an information technology research thesis at the end of the program. Online students begin their program with an online orientation. Students are provided an academic adviser who assists with graduation pathways and can help connect students to digital resources and departments. Online databases are accessible at any time of day. Librarians are available to assist with research during normal business hours. Students also have access to a tutoring and writing lab. The program consists of 30 credits and can be completed in one to two years. Cincinnati follows traditional semesters with fall, spring, and summer start dates. Applicants must have a minimum 3.0 GPA. Transfer students are accepted. Located in New Castle, Delaware, Wilmington University is a nonprofit university with a large online program. Students interested in information systems who also want to learn how to assist organizations by effectively utilizing technology, can enroll into Wilmington’s online master of science in information systems technologies. Wilmington offers four concentrations: technology project management, management and management information systems, web design, and information assurance. Core classes provide a foundation for understanding information systems through courses like data management, data communications and networking, and policy and strategy. Technology project management students focus on developing, scheduling, and budgeting projects. Students also examine agile project, risk, and quality management. Management information systems students explore concepts such as organizational theory and design while studying ethical issues in management. Web design students focus on design architecture and internet development. The information assurance concentration prepares students to develop and operate systems and computer security. Students also learn about topics such as radio frequency identification and risk management auditing. All concentrations require the completion of a capstone course and a supervised internship. Wilmington uses Blackboard, which provides continuous access to course material, submission dropboxes for assignments, access to exams, and discussion boards. Professors and classmates are accessible by email. Students have academic advisers who organize graduation pathways and address other program related concerns. Wilmington also has a writing center and a tutoring program for distance learners. The technical assistance department is also available during normal business hours. This program has 36 credit hours and must be completed within five years. Classes begin every eight weeks, providing students with year round start dates. Transfer students can apply. Wilmington accepts most coursework from accredited institutions. DePaul is a small, private Catholic school located in urban Chicago. Its master of science in information systems takes a broad approach that prepares students for leadership positions in information security. This 52-credit hour program combines advanced technical skills training with fundamental organizational knowledge, equipping its graduates for roles in traditional tech departments or larger business environments. Degree candidates choose from five concentrations, focusing on business analysis, business intelligence, database administration, IT enterprise, or general information systems. Each concentration consists of four foundational courses, 4-5 advanced skills courses, electives, and a capstone project. Elective requirements may be met with a wide range of class options within DePaul's information technology and business departments. All concentration paths are offered online or in traditional classroom courses, and locally based students may choose a hybrid degree that includes both formats. Distance learning is asynchronous; students view video recordings of live class lectures and complete assignments via a proprietary learning management system. In most cases, exams must be proctored, and it is up to the student to arrange for approved proctoring. Alternatively, DePaul’s master of science in cybersecurity, which offers concentrations in network infrastructure, security, and compliance, may be earned partially online. Select courses in this program offer video playback of in-class lectures. The school's master's in information security online program offers four start dates throughout the year, and the school accepts applications on a rolling basis, allowing students to begin the program whenever it suits their needs. DePaul does not require professional experience for admission to the program, but students can use relevant work in the field, industry certifications, and letters of recommendation to supplement their applications. Bachelor’s degree holders from all backgrounds are encouraged to apply to the program, and faculty advisers can work with students to determine the most effective course of study. While the specifics of any online master's in information technology program will vary according to the school and specialization chosen, programs in this field generally offer either a technical degree (for example, an MS in Information Technology) or a business degree with a technical focus (e.g., an MBA in Information Systems Management). Both types of degrees require completing foundational classes in computing and core classes in business systems and theory. The degrees are best suited for people with some background in computer programming or who have completed undergraduate degrees in computer science or engineering. Data Analytics This concentration trains students in probability theory, data mining, data visualization, and other techniques that will allow them to find solutions to business and societal problems by analyzing massive amounts of digital data. Data scientists, analysts, and architects in a range of fields, including biotech and telecommunications. Information Security A cybersecurity focus prepares students to handle emerging digital security threats. In addition to database and network security concepts, this specialization generally provides advanced knowledge in biometric systems, cryptography, and risk management. IT manager, information systems research scientist, and information security analyst. Financial Management of IT: This course introduces students to the basic technology, concepts, and tools used by financial managers to determine return on investment and make financial decisions, particularly regarding IT assets. Topics covered generally include budgeting, financial reporting, and proper use of accounting data. The skills learned in this course can be applied to careers as a IT financial manager, IT director, and chief information officer. Enterprise Data Management: The focus of this course is how to use data as a resource. Topics usually covered include emerging technology issues and development of database and repository administration skills. Some knowledge of database languages, such as Oracle or PL/SQL is often required. The skills developed through this course are used by data analysts and database managers in a wide range of fields, from large corporations and government agencies to small start-up technology businesses. Legal and Ethical Issues in Computing: This class explores the ethical responsibilities of programmers and the social and privacy concerns of citizens. Regulations affecting network operators are examined, as well as internal issues facing many technology companies, such as intellectual property and electronic marketing. The knowledge gained in this course is important for software engineers, software programmers, and IT leadership positions. Software and Security: This is typically a foundational course that reviews the concepts for overcoming insecure and vulnerable software. Coding techniques and programming languages are evaluated for effectiveness and deficiencies, providing a backbone of critical knowledge for all students interested in careers in corporate and small business IT departments. Capstone Project: Almost all master's programs require students to complete a written capstone project, which is similar in weight to a thesis. Capstone projects generally require research on a topic of the student's choosing and application of core concepts to a proposed solution to a problem. In some cases, a mandatory hands-on internship will take the place of a capstone project. HOW LONG DOES IT TAKE TO GET AN ONLINE MASTER'S IN INFORMATION SYSTEMS & TECHNOLOGY? The time it takes to complete master's in information systems online degree will depend on whether you choose to enter a program as a full-time or a part-time student. Most programs require anywhere from 32 to 48 credit hours. A full-time student can complete the required credits in a year and half, while some programs allow part-time students to take up to five years to earn their degree. The average completion time for most programs is between two and three years. Courses often allow learning at an individual pace, meaning you can log into classes on your own schedule. In some programs, cohort learning is a popular option. Cohort programs group students with similar career tracks together and put them on the same schedule of classes so they learn together. Certified Information Systems Security Professional (CISSP): Recognized by the Department of Defense and the U.S. National Security Agency, CISSP certification is often needed for positions such as security analyst, IT director, or chief information officer. In addition to passing an exam, earning a CISSP credential requires five years of work experience in a CISSP domain area, such as asset security or identity access and management. A master's degree in information systems and technology will reduce the required work experience by one year. Certified Information Systems Auditor (CISA): Issued by ISACA, an international professional association focused on information technology governance, CISA is a globally recognized designation for information systems audit professionals. In addition to passing the CISA exam, certification requires five years of experience in information systems auditing, control, or security. An advanced degree in information systems can qualify as one to two years of the required work experience. When choosing the best online master's in information systems, it is important to consider the school's accreditation status. Accreditation shows that the institution and the online master's in information technology have met rigorous standards set by the U.S. Department of Education (DOE) and the Council for Higher Education Accreditation (CHEA). Both the DOE and CHEA are agencies that establish and implement educational policies and standards so that schools all across the country meet the same criteria for excellence. Each of these agencies hold educational institutions accountable and advocate for quality education, ensuring that your degree is worth the time and money you've invested. Schools can be either regionally or nationally accredited. Programs with national accreditation are often considerably less expensive and will accept transfer units from a wider selection of schools. The majority of U.S. colleges are regionally accredited, and regional accreditation tends to have stricter qualifying standards, making it the accreditation type preferred by many licensing boards and employers. The best online master's in IT programs will have accreditation from the Accreditation Board for Engineering and Technology. For MBA programs in information technology, look for accreditation from the Association to Advance Collegiate Schools of Business. Institutional accreditation should be from an agency recognized by the DOE or CHEA. A list of all accredited schools can be found on both the DOE and CHEA websites. As technology continues to play a vital role in modern business and organizational management, the 10-year job outlook for information systems and technology professionals is exceptionally strong. According to the Bureau of Labor Statistics (BLS), the computer and information technology sector as a whole is projected to grow 12% between 2014 and 2024; this figure represents nearly 500,000 new jobs. Unemployment rates for tech professionals are also quite favorable. The table below looks at the unemployment rates for nine of the most popular IT occupations. Each entry on the list was included in the 'Best Technology Jobs' ranking published by U.S. News & World Report in 2016. Of the nine jobs listed, the average unemployment rate is 2.4%. By comparison, the national unemployment rate for all industries currently sits at 4.6%. In addition to a strong job outlook and low unemployment rates, those with a master's in information systems and technology also enjoy relatively high earning potential. However, individual salary expectations slightly vary by one's specific master's degree pathway. The following table explores salary projections at two career benchmarks for students who earn master's degrees in different information systems and technology fields. All seven degree subjects reported salary growth of at least 37.9% between the entry-level and mid-career stages. However, in addition to master's degree field of study, the salary growth for information systems and technology professionals will also depend on his/her specific job title. The next table examines expected salary growth and earnings for five of the most common careers in information systems and technology. Of the five occupations listed, computer programmers reported the highest career salary growth: a 49.7% increase between the entry-level and late-career stages. Information systems managers placed second with 45.1% growth after 20 years on the job, followed by software developers with 44.3% growth. Students who graduate with a master's in information systems and technology will be qualified for dozens of top-level positions, although individual eligibility will depend on additional factors like company size and city/state of employment. Four of the most common career pathways in healthcare management are detailed below. Network and Computer Systems Administrators: These administrators oversee the daily operations of their organization's different networks and systems. They are often responsible for creating, installing and modifying networks, as well as monitoring activity and maximizing security. Information Security Analysts: IS analysts develop and implement different tools designed to boost information security. Their programs target different types of security threats, from hackers and computer viruses to power outages, equipment failures and other technical issues. Database Administrators: Database administrators collect, evaluate and organize different types of organizational data, such as financial statements, employee records and customer shipping receipts. They also implement programs to ensure sensitive data is secure from outside users and not susceptible to technical issues. Computer and Information Systems (IS) Managers: Also known as IT managers or IT project managers, these professionals oversee the different computer-based programs and activities at a given company or organization. They regularly meet with organizational leaders to discuss technology goals, and then help implement tools and systems to ensure these objectives are reached. Making professional connections and learning about different approaches to information systems and technology is crucial to your success. Professional organizations offer a great entry point for students who want to learn more about their chosen career path. Below you'll find three of the country's most prominent organizations established for information systems and technology professionals. These organizations host networking events, provide online trainings, maintain active job boards, and offer other services for career-ready college graduates. Resources like these often prove invaluable as you complete your degree requirements and prepare to enter the job market. Association of Software Professionals: The ASP is a trade organization dedicated to software developers and engineers who design programs, apps and networks. The website features an extensive calendar of upcoming conferences and events, as well as full issues of the ASPects monthly newsletter.